Deal, Michael. "Mud Lake Stream Archaeological Site". The Canadian Encyclopedia, 04 March 2015, Historica Canada. https://www.thecanadianencyclopedia.ca/en/article/mud-lake-stream-archaeological-site. Accessed 18 April 2019. 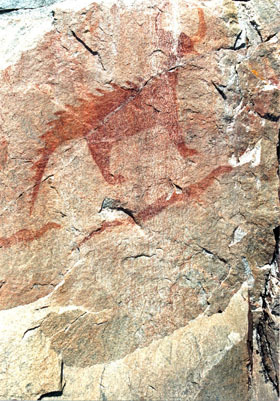 The Mud Lake Stream archaeological site is located along the Canada/United States border at the northern end of Spednic Lake, in southwestern New Brunswick. The Mud Lake Stream archaeological site is located along the Canada/United States border at the northern end of Spednic Lake, in southwestern New Brunswick. 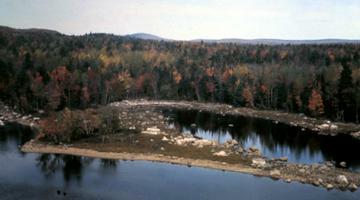 Spednic is the largest of 61 lakes that drain into the St. Croix River, which itself flows south into Passamaquoddy Bay. In historic times, and undoubtedly earlier, a portage route connected Grand and Spednic Lakes as part of an important interior travel route extending from present-day Maine to the Saint John River. The Mud Lake Stream site was discovered by a local collector, Bliss Goodwin, and first recorded as an archaeological site by David Sanger in 1972. In 1981, the St. Croix Waterway was designated a provincial recreation area. Expectations of increased human activity on the river and lakes, especially camping and canoeing, prompted a comprehensive archaeological survey in 1982. This survey resulted in a recommendation for the excavation of two First Nations sites on Spednic Lake, namely the Diggity and Mud Lake Stream sites. 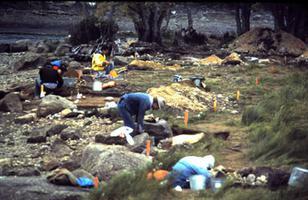 Extensive excavations were conducted at Mud Lake Stream from 1983 to 1985. Archaeological evidence indicates that the site was visited from Late Archaic times (5000-2500 years ago) into the historic period. While most of the site yielded evidence of Middle Woodland (about 2000 years ago) to recent occupations, isolated features indicated earlier Archaic and Early Woodland cultural associations. Radiocarbon dates from two features established a Transitional Late Archaic presence around 4000 years ago, identified with the northward movement of Susquehanna tradition peoples into the region. 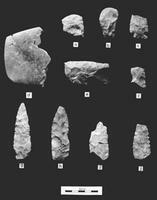 The Archaic assemblage included 14 complete or fragmentary large stemmed bifaces (probably representing spear points or knives), a stemmed drill base and two drill tips, a plummet and a fully grooved axe. Calcined bone fragments from one of the features were identified as belonging to the herring family (probably alewife or shad), indicating the early significance of this site as a fishing camp. Three Early Woodland (Meadowood) features were also excavated at Mud Lake Stream. One of them (feature 20) was a burial pit that had been partially eroded at the beach face, which contained faunal elements of dog, beaver, and a salmonoid fish species. No human remains were included, which suggests that it may have been a dog burial. Several artifacts, some of which were intentionally broken, were placed in the grave, including a slate gorget (an ornament that may signify group affiliation), a side-notched projectile point, and a serrated biface. Eight fragments of fabric-impressed (Vinette 1) pottery were also recovered within a one-metre radius of this feature. Another feature (feature 23) consisted of a small cache of nine Meadowood-style, side-notched projectile points. A third feature, containing only a calcined fragment of a barbed bone harpoon point, has been radiocarbon-dated to about 2750 years ago. The Middle Woodland component was associated with pottery bearing dentate, rocker-dentate and pseudo-scallop shell designs and expanding stemmed projectile points. The Late Woodland component was dominated by pottery decorated using a stick wrapped with cordage and corner-notched and side-notched projectile points. Residue analyses on fragments from nine pottery vessels dating from about 2000 to 1000 years ago indicated the consumption of terrestrial mammals (and/or plants), marine birds and fish. Forty-two charred seeds recovered from Woodland features were primarily edible berries (including elderberry, blackberry or raspberry, partridge berry and pin cherry). The faunal assemblage included primarily beaver remains, but also the mandible of a now extinct sea mink, a raptor claw (possibly hawk) and a salmonoid fish species (identified as either land-locked Atlantic salmon or trout). 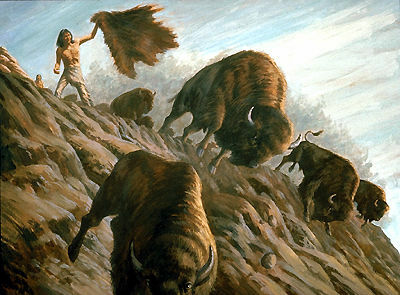 The faunal remains indicate that both hunting and fishing were important activities at this site during the late pre-contact period. Some researchers believe that the Chiputneticook-St. Croix drainage area was the principal interior resource area for the ancestral Passamaquoddy, while others feel that there were distinct interior and coastal populations. The archaeological evidence suggests that there were large settlement areas at opposite ends of Spednic Lake, exemplified by Mud Lake Stream in the north and Diggity in the south, which served as bases for hunting, fishing and possibly birding expeditions from late spring to fall. A winter use of the sites cannot be demonstrated, or ruled out. Sites in these areas contain the full range of material culture expected of multi-season encampments. The lack of postholes at the interior sites suggests that supporting posts for structures sat on the surface, like historic wigwams, in contrast to the semi-subterranean structures around Passamaquoddy Bay. The landscape between the residential areas is dotted with short term logistical campsites. Mud Lake Stream is significant as the largest relatively undisturbed site to be excavated on the interior of the Chiputneticook-St. Croix drainage system, and has the best preserved examples of the Transitional Late Archaic and Early Woodland occupations yet found in the Maritime provinces. See also Aboriginal People: Eastern Woodlands. Michael Deal and Susan Blair (eds), Prehistoric Archaeology in the Maritime Provinces: Past and Present Research, Council of Maritime Premiers, Fredericton (1991).